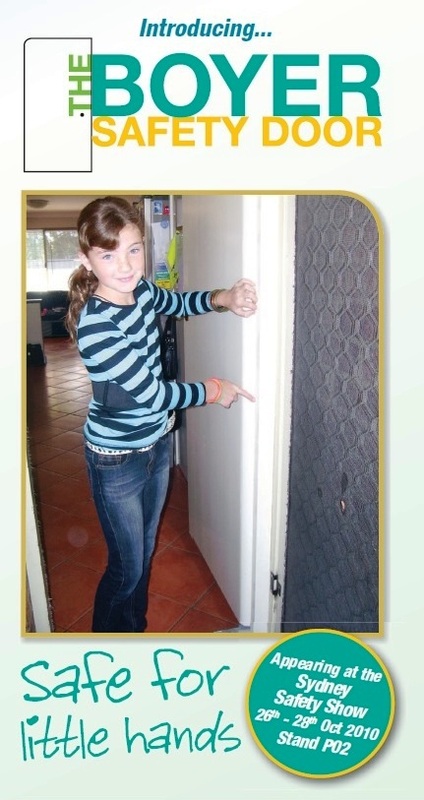 The Boyer Safety Door™ has been on display at Home and Safety shows in Sydney and Melbourne. Below are more details of each show. This show was put on by the Safety Institute of Australia (Inc). The theme of the 2011 show was Safety in Action Conference – New Frontiers. It was held at the Melbourne Convention & Exhibition Centre in South Wharf. It featured over 350 safety suppliers presenting thousands of specialised safety products and services. This conference was designed for managers and organisations looking at ways to improve the health and safety of their workplaces. During the three days, hundreds of registered attendees listened to expert presentations and visited us in the exhibition area. A prototype model of our Boyer Safety Door™ was displayed at stand M43 of the Australian Publishing Resource Service. This was our first appearance at a Home Show! We were at stand M08 at the Darling Harbour Exhibition Centre. We handed out almost 2,000 brochures. The feedback on the Boyer Safety Door™ was excellent. Many people were just as impressed with the aesthetics of the door as with its unique safety aspect. The simple yet revolutionary design of the Boyer Safety Door™ was introduced to the safety industry at Sydney Safety Show. It was received with great enthusiasm.Click on the image of the brochure on the right, then scroll down to see the reverse side…The Safety Show was held from 26 – 28 October 2010 at the Sydney Showground, Sydney Olympic Park.This was our first trade show, and the response was fantastic. We were literally inundated with people looking at the two doors we had on display – there were childcare centre operators, architects, developers, builders, OH&S representatives, government officials, tradesmen, door manufacturers, hingemakers, you name it – all stoked with the idea, saying things like “I like it… very clever… unbelievable solution… how simple… brilliant… I didn’t think it was possible… this design will be a trend-setter… it should be mandatory… the best thing I have seen at the show… most innovative… this will become part of building standards… , ” etc, etc. Some visitors returned with colleagues to show them our door. We even had other exhibitors coming over and showing it to their visitors! We have always believed that this design is superior to a conventional door and to any other protective device available. While all the industry people we have approached also share that view, we were quite overwhelmed to experience such positive feedback from a large number of people all committed to improving safety. The Show was an unqualified success. Click here to check out the photos. A questionnaire was available for visitors to complete, and some have offered optional comments These are reproduced below, with permission. Watch the video below to see the Boyer Safety Door™ in action at the Sydney Safety Show. We’re sure you’ll be impressed.